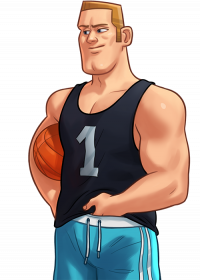 Dexter is an intimidating muscular jock of tall stature with a dirty blonde military cut and blue eyes. His typical attire consists of a black tank top and blue and white basketball shorts. Dexter comes across as a smug jerk. He is tactless, audacious, insolent and as dumb as a moss‐covered rock. The term Neanderthal fits Dexter perfectly. Violently covetous of his girlfriend, Roxxy, he regularly threatens anyone that may even potentially show any interest in her. Confident in his own skills, he challenges the main character in various games. However, he hides a little secret! Dexter is the average sports jock sporting an equally average popular girl as his girlfriend. He's the bully of the school and frequently attacks the main character and Erik. No one could approach his girlfriend without having to deal with him.